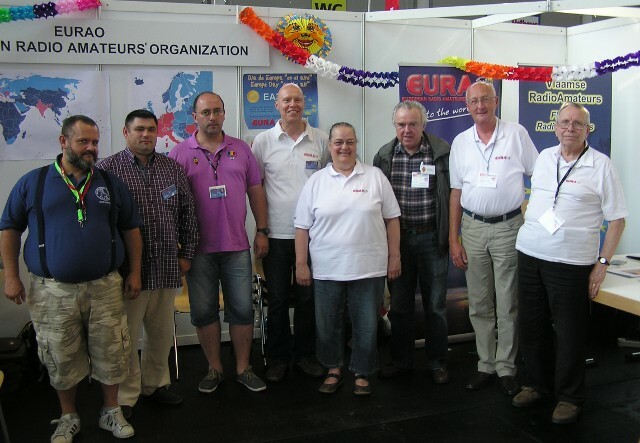 10th anniversary of EURAO and fourth time attending the exhibition in Friedrichshafen. Lots of hams to greet and exchange views. Members, yes, but also friends. Some of them old friends of each year. Others just met for the first time. True ham spirit in the air. That's our hobby, that's EURAO. This year we were visited from: Algeria, Austria, Belgium, Bosnia and Herzegovina, Bulgaria, Canada, Chile, Croatia, France, Hungary, Israel, Italy, Netherlands, Luxembourg, Mexico, Portugal, Romania, Russia, Spain, Switzerland, United Kingdom, USA and, of course, Germany, the host country. To all of them we offered some delicatessen from various countries, among which nicely chilled champagne and ham freshly cut by the expert hand of EA4ATK. Time to work on our buro, EuroBureauQSL, as in the picture above; to discuss new projects and plan future activities. Tasks to strengthen relationship among members of different associations, it doesn't matter where they come from. Also time to hold the annual Assembly, where we approved new members joining, a new Board of Directors and appointed Gust, ON7GZ, as Honorary President. We got a new EuroBureauQSL entry point in Algeria. And the typical draw for a free annual membership was won by OE6MAF - RX1AL. In the picture below, after the Assembly, you can see: IW3IBG, YO9RIJ, YO2MSB, EA3CIW, F1PSH, DC0KA, ON4PM and EA3CWZ. We hope to see you next year again in Friedrichshafen on 24-26 June 2016.